Villa Despoina, located on a hill, on estate of 50-60 acres, West of archeological mountain Zeus, that dominates the Heraklion skyline, surrounded by vineyards, olive, fruit-, aromatic trees, herbs and flowers, offering elevated views of Ayios Sillas plain, and the imposing mountain, found on the South-West of Knossos. A resort that satisfies all tastes, quiet and beautiful place, 15 min. from Heraklion. The location, the exquisite view, the wild natural beauty combined with luxury makes it an ideal place for rest, relaxation, contact with nature, sightseeing, and the exploration of the natural treasures. Outdoor area comprise terraces with vine and fruit trees, gardens with flowers and exquisite view to the mountain and sea a bit further. The private pool is located inside the mountain with the aromatic trees, surrounded by sitting areas ideal for taking breakfast or dinner. Because its central position on the island, easy and fast access to East, West and South of Crete. Guests also have the opportunity to taste the products produced in own estate (olive oil, honey, eggs, fruits, vegetables, ice cream from own shop). One can have walks on the estate and there is a tenniscourt. Villa Despoina is 15 minutes away from the capital of Crete, Heraklion. The national airport Nikos Kazantzakis is 15 minutes away by car and the port 20 minutes away. At the area of Villa Kreta you can find basic amenities such as a super-market, taverns, gas station. At the city centre there are shops, restaurants and activities for all kind of tastes. The closest beach is 20 minutes by car and after that guests have many options. The largest national hospitals are located 10-15 minutes away by car. There is always a family member at Villa Kreta that can help you in case of emergency. A very well organized and well known hemodialysis centre is located 15 minutes away by car. At villa Despoina you can come at the reception area (separate villa at a distance with no optical or acoustic contact) and we can give you information about the sights you can visit, while you can enjoy a coffee or a drink. As locals we can inform we can guide you to see the authentic part of the island the way we live it daily. - When people arrive, who will meet them? At Villa Despoina we focus to offer you best services. We can meet you at the airport or at the city if you previously travel around the island. In case you would like to rent a car we can arrange the car to be delivered at your villa on your arrival. In case you want to drive yourselves we can send you a map with guided instructions to help you out. ACTIVITIES IN THE ESTATE AND OUTSIDE THE ESTATE In the estate •	Book Reading If you decide to stay in the estate you can easily relax without being bored. 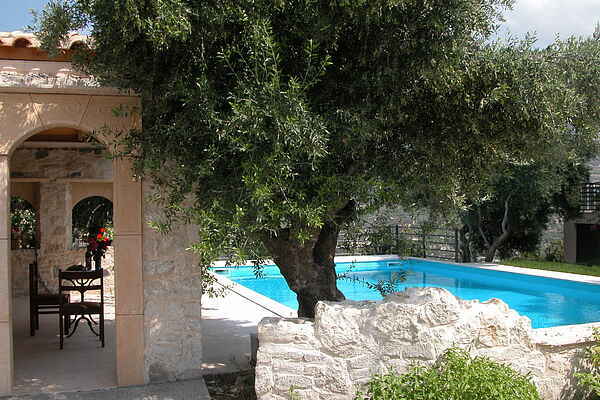 You can have a swim at the private swimming pool, read a book under the shadow of the trees and the cool breeze. In each villa there is a library of books in different languages but also translated books of Greek writers and poets. •	Tennis In the morning or early evening when it’s cooler you can practice you skills in tennis at the private tennis court in the estate. •	Bee keeping Visit our small bee garden always accompanied during the visit. Learn about the bee society, the herbs that bees prefer and honey production. Outside the estate •	Take advantage of a guided tour at the educational exhibition of our family in Heraklion, and get informed about renewable energy sources and the positive effects of their use on the environment. Enjoy the best gelato in town without any artificial additives made by the female family members that have combined the traditional recipes with nutritional science. •	Try your horse riding skills either at the area of the horse riding centre “ipposxesi” or by taking a ride around the hills. The horse riding centre is 3 km away. •	Visit and enjoy a tour by the most experienced wine producers of the local winery «Vinobon» by Alexakis family. Take advantage of the 15% discount on your purchases by using a special discount voucher. •	Visit Knossos Palace and the archeological museum of Heraklion and learn about the Minoan civilization, one of world’s oldest civilization. •	Thirty kilometers away you can find two water parks (water city, aqua plus), an 18 hole golf court and a bit closer (20 minutes by car) you have the chance to visit one of the biggest aquariums in the Mediterranean. •	At the city centre of Heraklion the opportunities for entertainment are so many since there are many restaurants, tavernas with live music, cinemas, bars etc. The festival organized every summer by the municipality includes theatres, musicals, concerts etc. •	At the village Kyparissi which is 20 minutes by car there is an open theatre «Theatro ton agron» where the yearly summer festival includes acting performances and concerts.